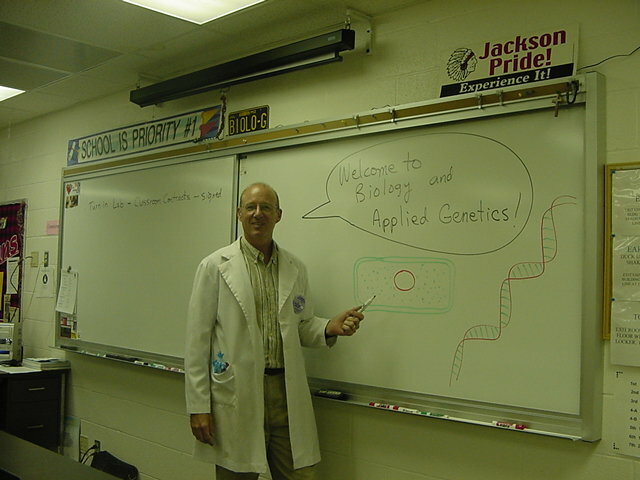 Welcome to this page which is provided primarily for my students at Jackson High School, where I teach Biology, Applied Genetics, and Marine Biology. JHS's new Math/Science Building is a state-of-the-art facility that was completed in August 1998. With lots of space and new equipment (and air conditioning! ), Biology students have been finding out that an understanding of the natural world is like a jigsaw puzzle: first you become familiar with each piece, then comes the challenge and fun of fitting the pieces together to make an awesome, complete picture. Students in Applied Genetics complete a full quarter each of microbiology and molecular biology. A big thanks to St. Francis Medical Center Laboratory for their hospitality earlier this year. The class enjoyed their field trip to the Lab, a follow-up to my two-week internship there three summers ago. The Lab also generously supplied some surplus media which was used by the AppGen researchers in performing a "mock" clinical diagnostic lab procedure. Later, they will be involved in DNA technology including investigations in restriction enzyme action and DNA fingerprinting. Several times during the school year, Mr. Lynn Cotner and I present our Chemistry "magic" show to various fifth grade classes in the R-2 district. Our goal is to educate and entertain in a semi-Bill Nye style. Parents, all of my students are required to keep a record of their grades in their folder at all times, as well as a copy of the current unit's Objective List. Please become involved in your son or daughter's education at JHS by periodically looking over these documents with them. A special HELLO to students exploring the internet in Janet Ludwig's class! Check out these interesting sites! Human Genome Project Information - includes links to the genetic world. Florida Keys and tourist information at this Official Site . Review SCUBA Physics & Buoyancy and Gas Laws.